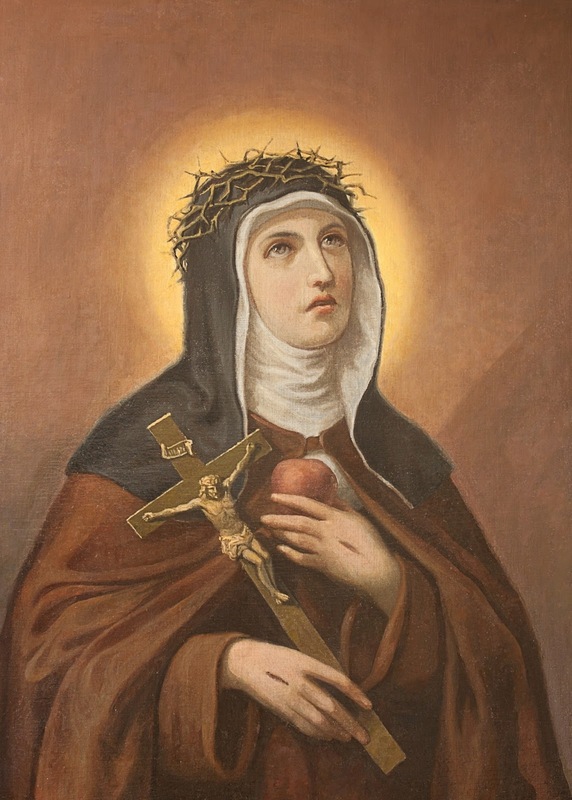 Jul 10 – St Veronica Giuliani, OSC Cap, (1660-1727) – Religious, Mystic, Stigmatist | ADULT CATECHESIS & CHRISTIAN RELIGIOUS LITERACY IN THE ROMAN CATHOLIC TRADITION: hosting ONLY True Christians!! !, or "How to think Catholic!!" Veronica’s desire to be like Christ crucified was answered with the stigmata. Baptized Ursula, she was born in Mercatello in the Duchy of Urbino, Italy, in 1660. We would think it sentimental today, but Veronica’s mother, as she lay dying while Veronica was still a child, would have understood it more practically, wanted divine protection for her five children after she was gone. When dying Benedetta (nee Mancini) Guiliani, Veronica’s mother, she called her five daughters to her bedside and entrusted each of them to one of the five wounds of Jesus. Ursula (Veronica) was entrusted through prayer to the wound below Christ’s heart, created by the Roman soldier testing to see whether the Lord was actually dead yet, from which blood and water flowed. Ursula took the religious name Veronica. (A religious name is a new name those who enter consecrated/religious life often take to signify and symbolize their death, poetically and spiritually, to their former life and now the beginning of their new life dedicated to serving God.) Ursula took the name Veronica, in honor of the Passion and the woman whom tradition (although not Scripture) holds wiped the face of Jesus as he carried His cross, and an image of the Lord’s face was left on her cloth. Ursula entered the Poor Clares directed by the Capuchins at Citttidi Castello, Umbria, in 1677. She remained there for the rest of her life and served as novice mistress for thirty-four years. Her father, Francesco, an official in the local government, had wanted her to marry, but she convinced him to allow her to become a nun. In her first years in the monastery, Veronica worked in the kitchen, infirmary, sacristy and served as portress. At the age of 34, she was made novice mistress, a position she held for 22 years. 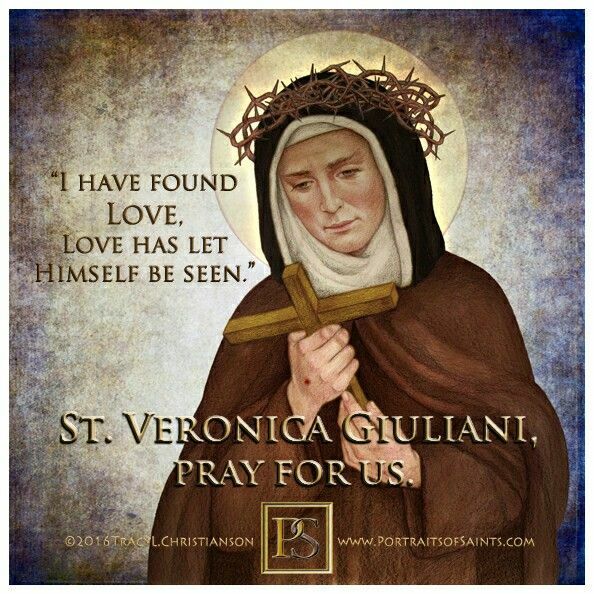 When she was 37, Veronica received the stigmata, literally, mystically – the wounds of Christ Himself – considered by Catholics a great honor and a sign of personal sanctity given by the Lord Himself to only a very few with whom He has a special relationship. Life was not the same after that. In our modern times, Padre Pio (1887-1968) and Theresa Neumann (1898-1962) are two examples regularly inspected by modern doctors and theologians. 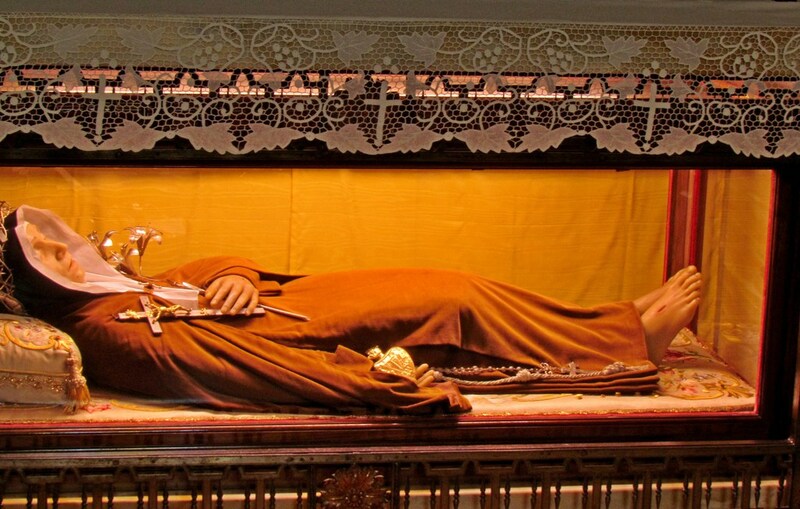 St Francis of Assisi is another historical example. Dr. Imbert Gourbeyre, a Paris doctor, researched and compiled a two volume work which says that (up to that date of 1894) there were 321 historically recorded stigmatists. (Stigmata is no fluke or aberration of history.) The Catholic church had at that point only canonized (officially declared as saints) 62 of them. As a mystic, recipient of a stigmata in 1697, and visions, the accounts of which are quite detailed, Church authorities in Rome wanted to test Veronica’s authenticity and so conducted an investigation. We get the expression “devil’s advocate” from such investigations of the Church and the proceedings of canonizations. A skilled and knowledgeable Church official is appointed to be the “prosecutor” in opposition to the claimant or representative (postulator of the cause) of the deceased holy person reputed to have direct Divine experience or heroic Christian virtue. Veronica lost the office of novice mistress temporarily and was not allowed to attend Mass except on Sundays or holy days. She submitted to many medical examinations and treatments of the day and the scorn of her peers. She never tried to prove the reality of the wounds, merely suffering through their pain. Through all of this Veronica did not become bitter, and the investigation eventually restored her as novice mistress. She impressed her fellow nuns by remaining remarkably practical despite her numerous ecstatic experiences. 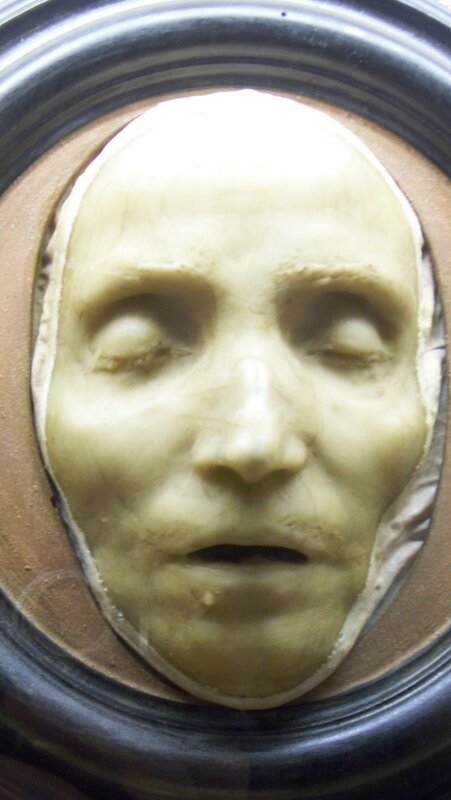 Veronica was named abbess of the convent in 1716, remaining in that role until her death. She is called one of the most extraordinary mystics of her era. Veronica was very devoted to the Eucharist and to the Sacred Heart. Her ten volume “Diary of the Passion” catalogues her mystical experiences. 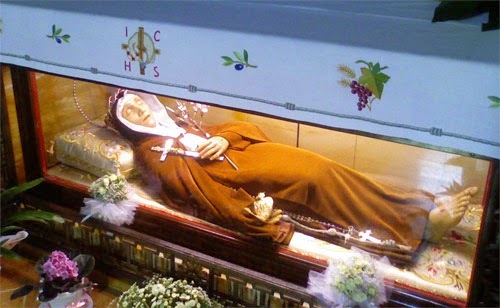 St Veronica Giuliani is one of the “Incorruptibles”, those saints who have died but whose bodies have not decayed.